Throughout the convention visitors will have an opportunity to reserve a seat aboard a helicopter and get grand aerial views of the World's Greatest Aviation Celebration. Flights over the convention grounds are available in Bell 47 helicopters, and extended premium flights are available in a Schweizer turbine helicopter. The Bell 47 flight experience features flights over the convention grounds in the aircraft that's well known as the type featured in M*A*S*H. Flight times are Sunday, July 27, from 10 a.m.-5 p.m.; Monday, July 28-Thursday, July 31, 8 a.m-6 p.m.; Friday and Saturday, August 1-2, 8 a.m.-5 p.m.; and Sunday, August 3, noon-3 p.m. The cost is $49 per person and flight tickets are available for purchase (walk-ups only) at Pioneer Airport's Pitcairn Hangar, located behind the EAA AirVenture Museum. Shuttles to the museum run from the Bus Park frequently. Our premium helicopter flight experience provides two passengers with a 30-minute, private aerial tour of everything surrounding AirVenture aboard the Schweizer 333 turbine helicopter, offered by Aero Optics, Inc. Included is a flight over the AirVenture Seaplane Base, and up the shoreline of Lake Winnebago. To top off the experience, passengers can have a high-quality colour photo taken in front of the helicopter. Book now-Cost is $740 for two passengers (no single reservations accepted). While on the convention grounds, reserve your flight at the EAA Welcome Center or the Main Gate kiosk. While the Red Arrows are the centre of attention as they celebrate their 50th display season, they aren't the only national display team commemorating a half century at the Royal International Air Tattoo this year. The Swiss Air Force's Patrouille Suisse are also marking their 50th birthday in 2014, having flown their first display on August 6, 1964. The team was initially equipped with the venerable Hawker Hunter Mk58. They flew that aircraft until 1994, when they swapped the Hunter for the faster and more manoeuvrable Northrop F-5E Tiger II, and they have been displaying the Tiger ever since. The Patrouille Suisse performs with six aircraft which split during their colourful and thrilling display into a formation of four, along with two solo / synchro jets. 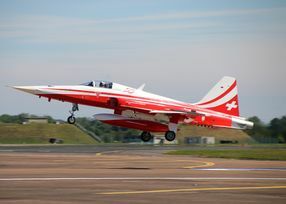 The team's home base is Emmen Air Base, just northwest of Lucerne, and Patrouille Suisse's display typically lasts approximately 18 minutes. All the aircraft are equipped with white smoke generators. As part of their 50th birthday celebrations, the Patrouille Suisse are performing a mixed formation flypast with a Hunter Mk58 in their display routine. The flypast is the first time the Patrouille Suisse has flown in formation with a Swiss Hunter at a UK airshow. 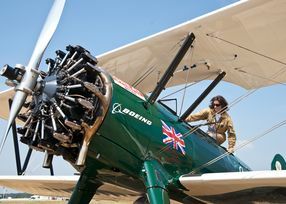 Last year Tracey was here as she prepared for an epic journey flying from Cape Town to Cairo and she's back again, having now completed her record-breaking flight, which was inspired by a 1928 trip undertaken by glamorous adventurer Lady Mary Heath. A film crew captured Tracey's epic and sometimes dangerous journey, and the result is a documentary entitled 'The Aviatrix' which the pilot is hoping will be broadcast later this year. Tracey said: "It's amazing to be back here at RIAT because in many ways this is where some hugely important parts of the adventure began, notably meeting Boeing who became my first sponsor! "This time last year I had literally just got the aircraft and flown it back across Europe. We applied all the branding and I flew in to Fairford, so it was incredible to be here at RIAT and then to receive the Concours d'elegance award for the best-presented civilian aircraft. It was one of the best weekends of my life." She added: "It's wonderful to be back and there seems to be so much interest in the project and the aircraft: I am looking forward to meeting everyone this weekend. 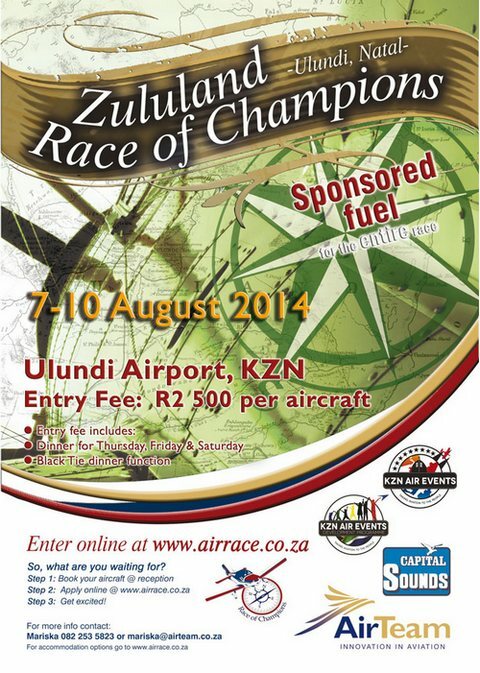 Hopefully the project will inspire more people to go flying and to retain some of that spirit of adventure." 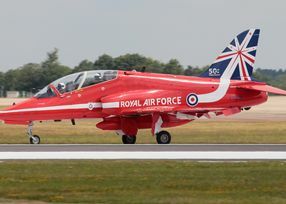 Squadron Leader Jim Turner, Red 1 and the leader of the Royal Air Force Aerobatic Team, the Red Arrows, is excited to be at RAF Fairford this weekend. Leading the Red Arrows in the team's 50th display season is a massive privilege and one that Jim is quick to acknowledge. But surely that level of adoration isn't a surprise for the Reds any more? Celebrating a 50th season means that the Red Arrows' schedule is busier than ever, and Jim notes just how hectic the team has been. Today (Friday) will see the Red Arrows joined by the team leaders of the other display teams scheduled to appear at RIAT for a very special birthday flypast, including the Patrouille Suisse which is celebrating its own 50th in 2014. 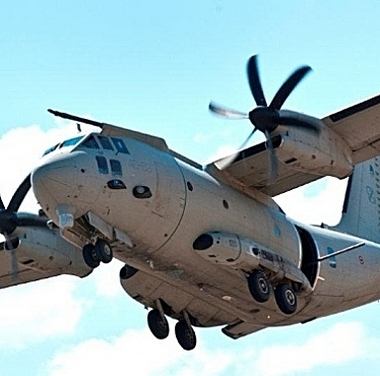 ATK announced that the ATK and Finmeccanica-Alenia Aermacchi have successfully completed the first phase of ground and flight testing of the fully configured multi-mission MC-27J tactical transport aircraft with the support of the Italian Air Force (ITAF). The series of tests exceeded all test objectives and demonstrated the accuracy of ATK's side-mounted GAU-23 30mm cannon. 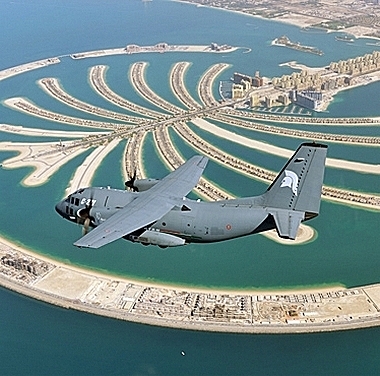 The ITAF MC-27J aircraft was modified with an L-3 Wescam MX-15Di Electro-Optical and Infrared Turret mounted under the nose of the aircraft to support multi-mission applications such as a Gunship, Intelligence, Surveillance and Reconnaissance(ISR) and Search and Rescue (SAR) missions; various radio and data links and ATK's Roll-On/Roll-Off (RORO) palletized gun and mission control systems. The MC-27J is an advanced multi mission system jointly developed by ATK and Alenia Aermacchi, based on the C-27J, the most state-of-the-art twin-engine turboprop tactical transport aircraft currently available on the market that provides unequalled performance. ATK and Alenia Aermacchi announced their intent to jointly develop and market the MC-27J multi-mission aircraft at the 2012 Farnborough Air Show. The internally funded test and development program successfully completed its first phase in the spring of 2013. Following closely behind its recent FAA certification, the Cessna Citation X+, the world's fastest business jet, completed its first trans-Atlantic crossing in a normal business flight profile in 5 hours, 33 minutes for an average ground speed of 502 knots. Cessna is a subsidiary of Textron Aviation, a Textron Inc. company. The Citation X+ flew from the Cessna factory in Wichita, KS to Presque Isle, Maine, then 2,788 nautical miles non-stop to Cessna's facility at Paris Le Bourget for an event. The Citation X+ then completed its journey at TAG Farnborough Airport. For the trans-Atlantic leg, the aircraft made a direct climb to 45,000 feet, accelerating to an initial cruise speed of .86 Mach, then to .88 Mach for much of the flight to Paris. �Just as impressive as the speed of the aircraft - and the time saved - is the large cabin, the comfort, and the smart cabin technology that really make this the jet for business,� Shortt said. The new Citation X+ has seating for up to 12 passengers, a maximum altitude of 51,000 feet, an unmatched maximum speed of Mach 0.935 (617 mph, 536 ktas) and an increased max range of 3,408 nautical miles. The most distinct outward difference with the evolved Citation X+ is the addition of winglets, allowing the aircraft to cruise efficiently at higher altitudes and to consume less fuel, as well as improving take-off and landing performance at higher elevations or on hot days. Powered by two FADEC-controlled Rolls-Royce AE3007C2 turbofan engines, the Citation X+ can fly above commercial traffic and some adverse weather at a maximum altitude of 51,000 feet. The cockpit of the Citation X+ features ergonomic seats designed for transcontinental flights, and a dual-zone temperature control system keeps pilots and passengers comfortable. The flight deck is centred on the Garmin G5000 avionics package with four intuitive, full-colour touch-screen LCD control panels and three 14-inch high-resolution displays, as well as fully integrated auto throttles to reduce pilot workload. Standard Garmin Synthetic Vision Technology on the primary flight displays gives the crew a virtual reality view of runways, terrain, traffic and obstacles. Autothrottle is integrated with the Flight Management System and Automatic Flight Control System for computer control of engine thrust, set to maximize either thrust or speed. The system can be engaged prior to take-off roll to control fuel flow throughout a flight, from take-off to touchdown, or disengaged for manual throttle operation. The lengthier cabin is built around a proprietary intelligent cabin management and entertainment technology solution integrated with the aircraft's avionics and electrical systems. Cessna's ClairityTM provides passengers individual touch screens to control cabin lighting, window shades, temperature, and audio and video entertainment (digital media, MP3/iPhone, Blu-Ray). The interior of each new Citation X+ can be tailor-made to the customer's specifications in seating layout, colour choices and entertainment options that can include global, satellite Wifi connectivity.